I’ve never really been the kind of quilter who buys fabric without a specific project in mind. Most of my stash is scraps that fit under my sewing table in 10 Cuties boxes. When I started making quilts, my kids were little, so for each piece I made, I created a corresponding doll quilt for my daughter. 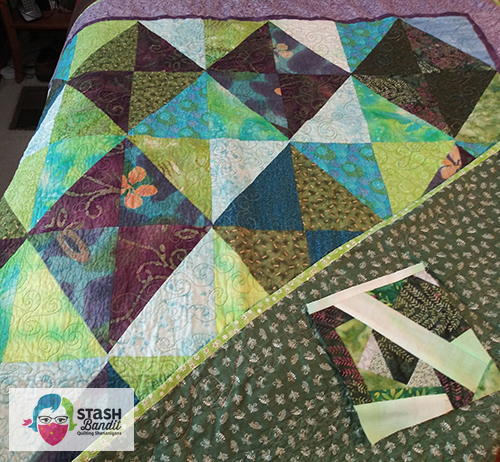 They were fun little projects that gave me a chance to do a tiny bit of hand quilting and made me feel less guilty about time spent sewing instead of playing with the kids. 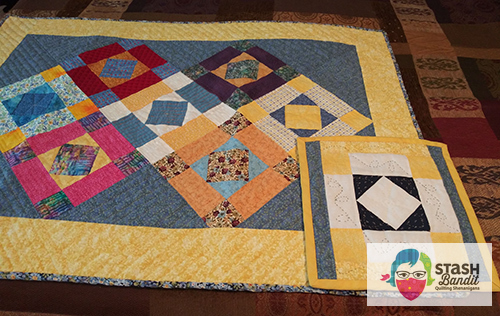 It wasn’t until I saw the Gee’s Bend exhibit in Denver and actually met the quilters that I became really excited about using up my stash. 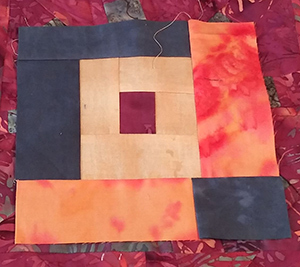 I came to realize that a quilt could be made with randomly-sized pieces in random colors. 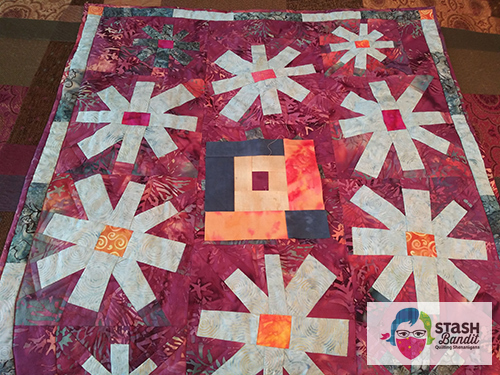 Lisa improvised the Log Cabin block lying on top of this daisy quilt from leftover scraps. 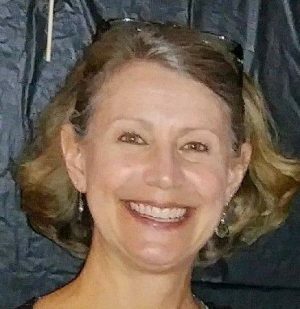 I started improvising blocks—wonky Log Cabins and the like—from unplanned bits and pieces, squaring them up to 6½ inches because that’s my favorite little ruler. The blocks use up leftover fabric but they’ve also evolved into a nice way to decompress after working intently on a specific pattern. I don’t have to concentrate on matching points or on scant quarter inches. I can just play. 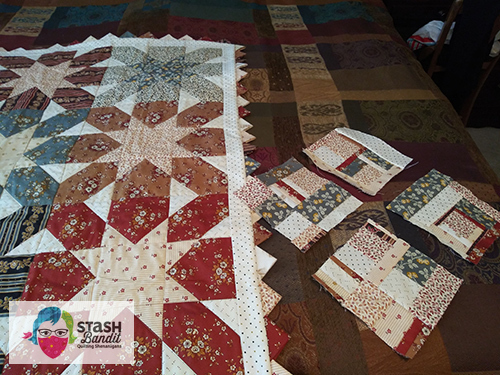 And in doing this with my scraps at the end of each project, I’ll eventually have enough blocks for a memory quilt. It will tell the story of decades of quilts, many of which were given as gifts long ago. Isn’t this a great idea? What a treasure that memory quilt will be. 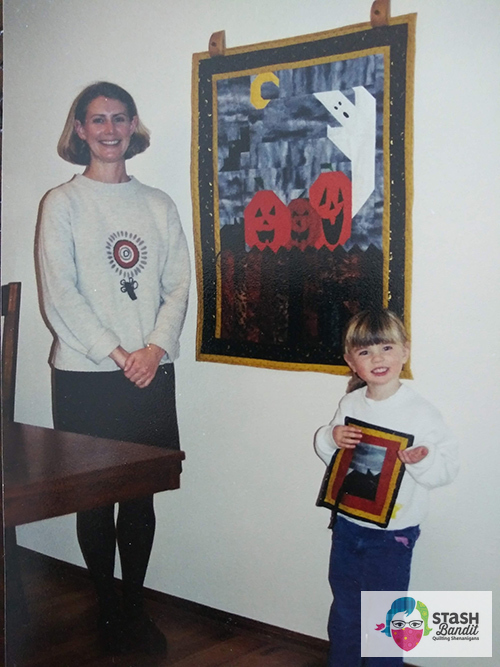 I imagine it as a piece that will bring Lisa comfort and evoke happy memories, perhaps even down the road when her hands don’t work as well and her eyes don’t see as clearly as they did when she was young. What could be better than that?! 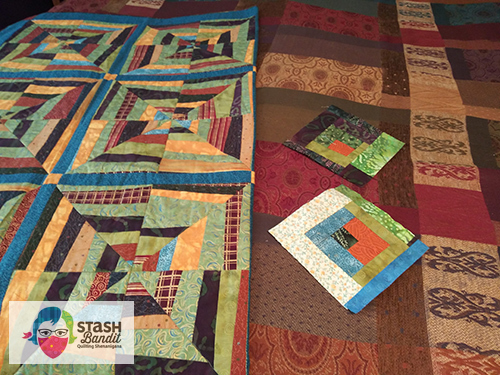 Lisa, thank you for sharing your idea and your quilts with Stash Bandit’s readers today. I usually make a very small quilt from my scraps so I can remember the quilt. I hang them around the ceiling in my quilting room. I do enjoy them. Great idea. ESP for a widow block, which might be sewn in a backing or made into a pillow. Love this. They could be donated for Amanda Quilts (made for babies lost in the hospital) or ICU babies too. I used to save all my scraps thinking some day, I’ll do something with them. 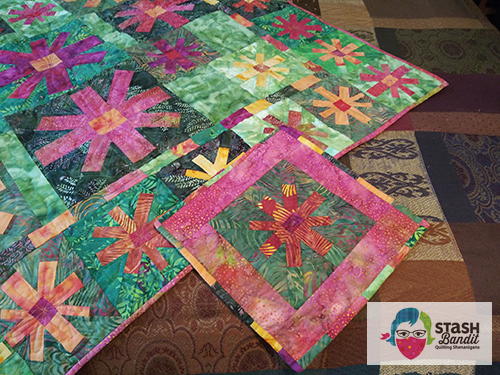 Thanks to wonderful teachers and friendly quilters, I like to mix some of those scraps in. It does remind me of projects I’ve worked on. Fabric is just fun!